An easy 14er? OK, that’s an oxymoron. An “easier” 14er is probably the best description for the South Mount Elbert Trail. Also known as the Mount Elbert East Ridge Trail, it climbs the east ridge to the summit of Mount Elbert, the highest mountain in the Rocky Mountains at 14,433. The trail is classified as a Class I by 14ers.com, which means it is easy hiking and usually a good trail. But remember an easy 14er is an oxymoron. The South Mount Elbert Trail still climbs more than 4,000 feet in five miles at a high elevation. For the Forest Service description, click here. For the description on 14ers.com, click here. Another Class I climb to the summit of Mount Elbert is the Northeast Ridge, which 14ers.com says is the main route. This route is about a half mile shorter but has more elevation gain, so I chose to hike the South Mount Elbert Trail. The Mount Elbert East Ridge seems to have a gentler slope than the northeast ridge, although it’s still super steep. From Leadville, head south on U.S. Highway 24. Take Colorado 82 (or Top of Rockies Byway) west toward Twin Lakes. Turn right onto road 24 and follow it until you come to the trailhead, just past the Lakeview Campground. From this trailhead, the summit is seven miles and climbs 4,900 feet. However, if you have four-wheel drive you can follow the dirt road just to the right of the trailhead parking lot and drive to a second trailhead, which is at the end of the 4WD road. From this trailhead, the summit is five miles and climbs 4,100 feet. I have a Honda HRV, and I was able to make it most of the way to the second trailhead. I did have to stop and park in a pullout about a half mile from the second trailhead because I came to a stream that I wasn’t sure my Honda could cross. Also, when looking for the trailhead in the dark I drove past the first trailhead, completely missing the road just to the right. This cost me an hour and a half, that I really didn’t have. Just note the 4WD road is immediately after the parking lot for the 2WD trailhead. When researching the South Mount Elbert Trail, I came across several different distances. 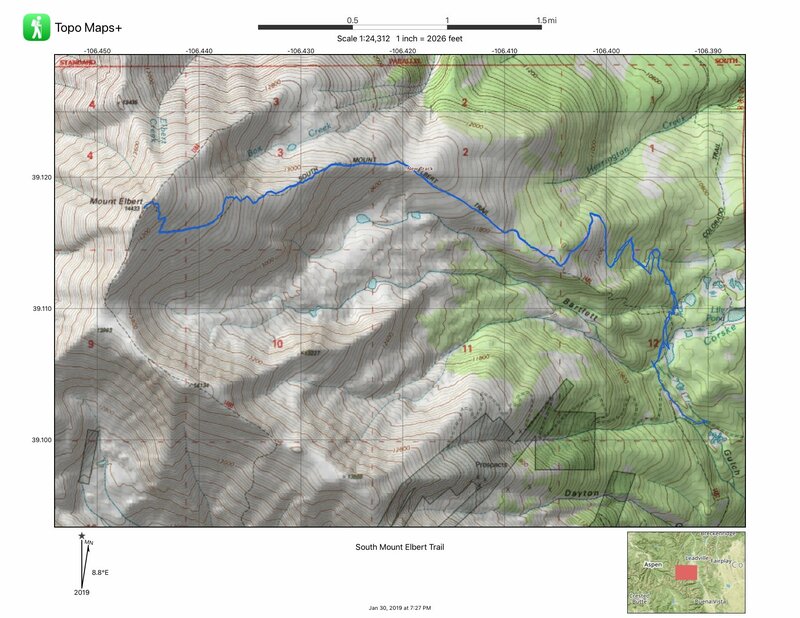 14ers.com says it is 10 miles round trip from the 4WD trailhead, and I found this to be the most accurate. My GPS tracked me at 10.83 round trip. But that only counts one way from where I left my car on the side of the road to the 4WD trailhead. On the hike out, I hitched a ride from the 4WD trailhead back to my car. For clarity, I want to state that when I use distances in this trail guide from now on, I am counting from the 4WD trailhead, not where I parked my car. The South Mount Elbert Trail begins by following the Colorado/Continental Divide Trail. At about 0.4 miles, the South Mount Elbert Trail splits from the Colorado/Continental Divide Trail and begins to head west, hiker’s left. At about 0.3 miles there is an old trail that goes to the left, but it has been closed to protect the ecosystem. The new trail was not on my topographic map. But 14ers.com noted it, so I knew to watch for it. Also, it was pretty well marked off so I knew not to go that way. From there, the trail takes hikers up through a series of switchbacks until you come to the tree line. Once you are out of the trees, the trail steadily climbs northwest. Around 2.5 miles and 12,000 feet, the trail gets steep. Being a flatlander from Arkansas, I had a hard time with this part. It’s not steep for very long, but it took me a while because I had to catch my breath. I actually thought about quitting at this part. But I looked up and saw it looked like it leveled out, or as leveled out as a 14er can get, so I pushed on. At around mile 3 to mile 3.3, the trail gets really steep. The Hiking Project shows a 24 to 27 percent grade for the 1/3 of a mile. This was the second part I almost gave up on. Anyone who has summited peaks knows not to get your hopes up when you think you see the peak ahead. However, at this part, I thought I saw people hiking off what I thought was the peak. “It is only that much further, I can make that,” I told myself. But the hikers were not coming immediately off the peak. When I got to the part that I thought was the peak, I was disappointed to realize the trail swings around to the south at mile 4.25 and approaches the peak from the southeast. However, as it swings to the south it’s a fairly easy walk; that is for as easy as it is to walk at 13,700 feet. When the trail hits 14,000 feet, at mile 4.6, it then begins the approach to the peak through a series of switchbacks. Right at mile 5, you make it to the top. I think it’s important to note that my hike on the South Mount Elbert Trail was the slowest I have ever hiked. It is the most elevation gain that I have tackled, but I also believe being a flatlander my muscles just couldn’t move as fast with the lack of oxygen. You really need to be off the summit by noon because lightning and afternoon storms are a real danger. I budgeted a mile an hour, but wish I had gotten an earlier start. Not finding the trailhead right away also hurt me. When I got back to camp and texted my loved ones that I made it and that I was OK, I told my best friend that I didn’t think I would do it again. Buuuut, now that I’ve rested, I definitely would. The South Mount Elbert Trail is a wonderful hike with sweeping views of surrounding mountains. And making the summit was more than worth the pain in climbing Mount Elbert.